I just purchased Videotools 2.3. I purchased it solely for the new Blackmagic Capture plugin. I have a 2011 MacPro with a Decklink Duo card installed. I was planning on using Videotools on 10.7 with Quartz Composer 4.6. I am aware that this software is not supported on 10.8 so I was intending on using 10.6 or 10.7. In my first composition, I loaded a Blackmagic Capture plugin and a Billboard patch. 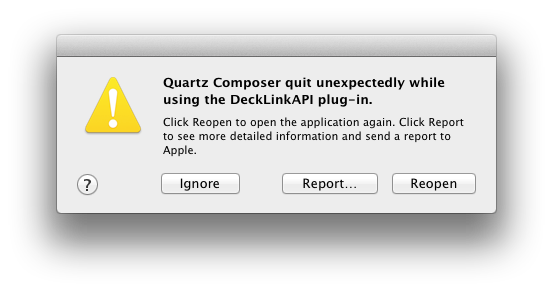 As soon as I connect the image output of the BM capture to the image input of the Billboard, Quartz Composer crashes citing a Decklink API error. Here is the crash report that gets spit out. @spendergrass: Thanks for your report, and I'm sorry about the trouble. We've been discussing this issue over on this forum thread. We hope to have a fix available in the near future. @spendergrass: this crash is fixed in VideoTools 2.4. Thanks for your patience.